The follow-up to one of the most awarded games of all time! 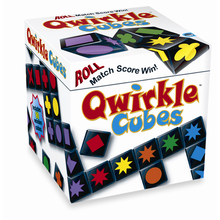 Qwirkle Cubes plays much like our original Qwirkle game--create rows and columns of matching colors or shapes to score the most points--but adds to the strategy because you can roll your cubes for more chances to play the exact shapes you want! Also, because everyone plays open-handed, you can analyze your opponents' future moves. 2 to 4 players. Warning: Choking Hazardâ€”Small Parts. Not for Children under 3 yrs. Other products in the "Qwirkle" series. It's like Qwirkle, but instead of tiles, there are colored dice/cubes with all the shapes. While it adds the possibility of more of a certain color/shape combination, I still find I like the original better.